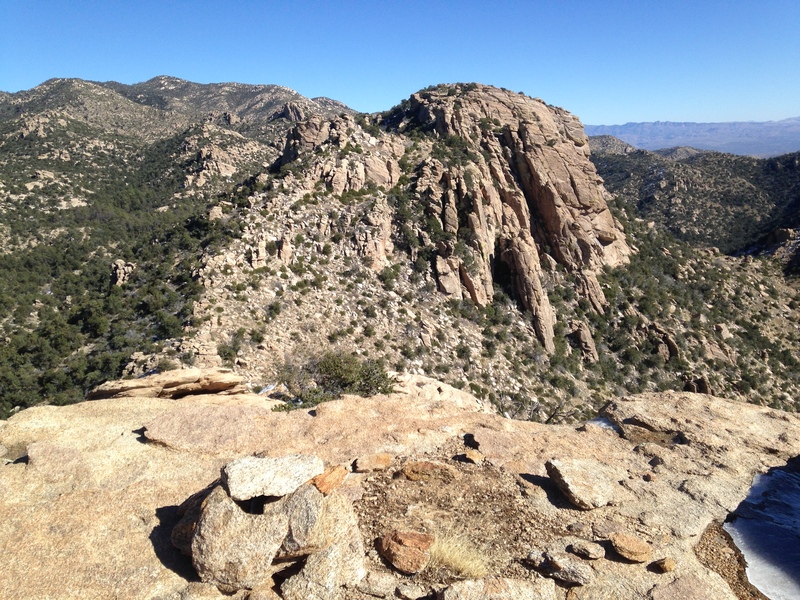 Every time I’ve ridden up Mt Lemmon I’ve gazed at the rocky peak above Molino Basin. It looks rather like Thimble Peak and I suspect it’s occasionally confused with that. I haven’t been able to find out if it has a name, so I’ve called it Molino Thimble (edit: 1/7/18 – I’ve since discovered that it’s known to rock climbers as The Thumb). It doesn’t look very easy to climb and I’ve often wondered if there’s an easy way up the side you can’t see. Finally I decided to explore and find out for myself. I discovered that there’s a hike that goes up a peak called Airmen Peak then continues to loop behind Molino Thimble, and figured this would be a good way to explore the area. The best outcome would be if I could find a way up Molino Thimble. Failing that, I’d still get to climb Airmen Peak. And about that strange name….. This shows a counter-clockwise route. I went clockwise. The route descriptions shown in the two pages I link to at the bottom of this page both describe a counter-clockwise loop. They mention that the downhill part, after Airmen Peak, is quite a bit more difficult than the uphill part. Well, I always think it’s better to go up the harder terrain rather than down, so I decided to go clockwise. There was also another reason for that decision – it meant I’d first reach Molino Thimble, my primary goal. Park at Molino Basin and start hiking up the obvious canyon that leads up to the left of Molino Thimble. There’s no real trail but the canyon is mostly easy to follow. There are a few places where you are faced with small cliffs but you can scramble up around them, generally on the left. Eventually the canyon curves round to the right and you’ll need to leave the canyon floor and hike up to the back of Molino Thimble. 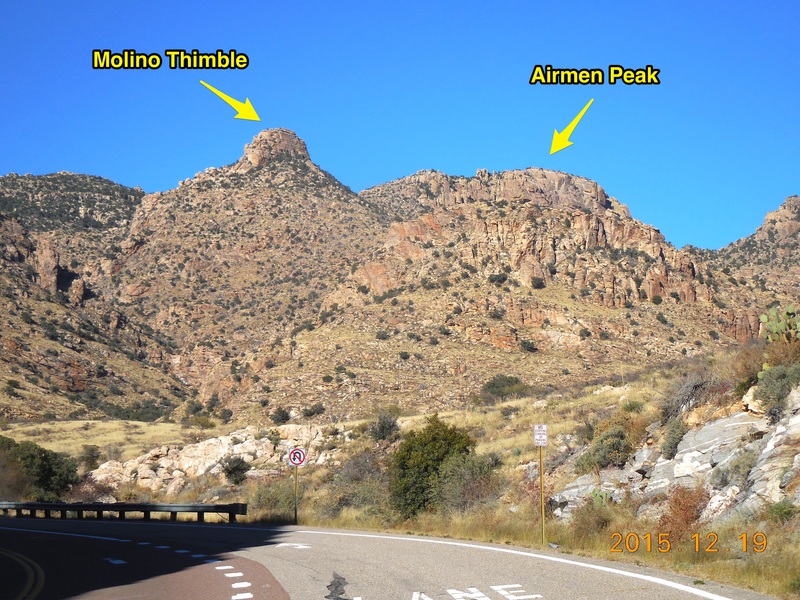 When I did it in December 2015, the canyon and north-facing slopes to the north of Molino Thimble and Airmen Peak were covered in ice and snow from a recent storm. Fortunately the chimney on Molino Thimble was mostly clear of ice. Near the left (east) end of the Molino Thimble is a deep chimney. Walk up to the back of this. From here chimney up through a hole created by two wedged boulders. Climb outwards over another wedged boulder and you are soon on easier ground. The chimney is mainly 3rd class, with a couple of easy 4th class moves. Fortunately there’s no real exposure and a rope is unnecessary if you are comfortable with 4th class scrambling. Climb back down the same way. From the base of Molino Thimble, follow the ridge line easily to the east and up to the summit of Airmen Peak. 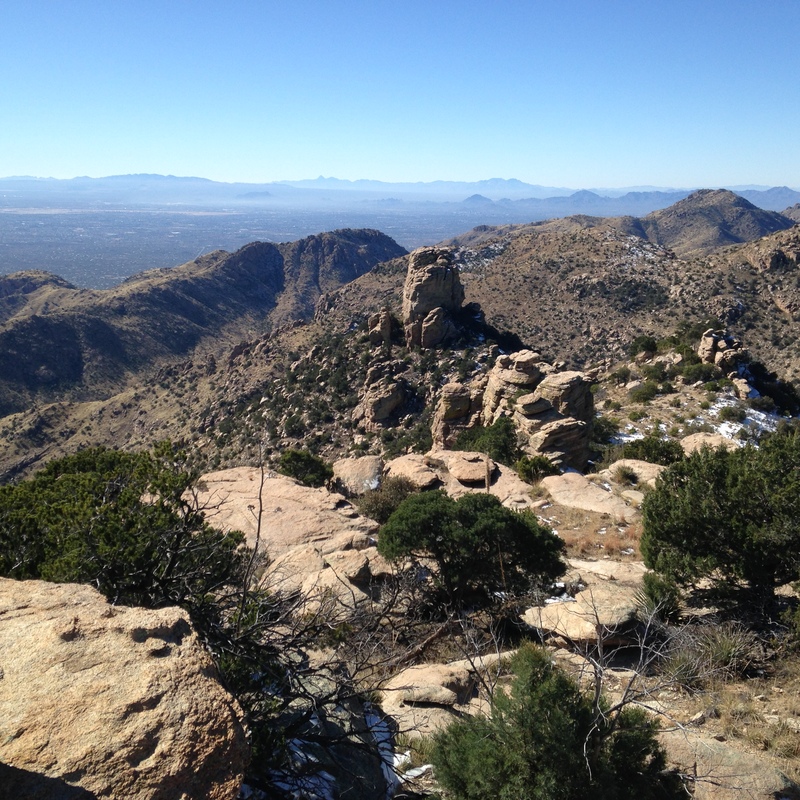 After enjoying the view from the summit, retrace your steps a short way then head down into the canyon to the north. There are some cliffs below you and you can go down the hillside to the west of the cliffs, or down a steeper slope to the east of the cliffs. When I did it I went down the snow covered east slopes which was rather exciting. Follow the canyon down until it merges with the much bigger Molino Canyon. There’s no real trail and you’ll just have to pick your way down through the rocks and vegetation. Once you reach Molino Canyon turn right and follow this down to the car park. This section contains the best hiking on the whole trip. There is a long section of water-polished rocks and boulders which is a delight to navigate down. Eventually you’ll reach some cliffs that are too big to scramble down and you’ll see a path leading down to the right. 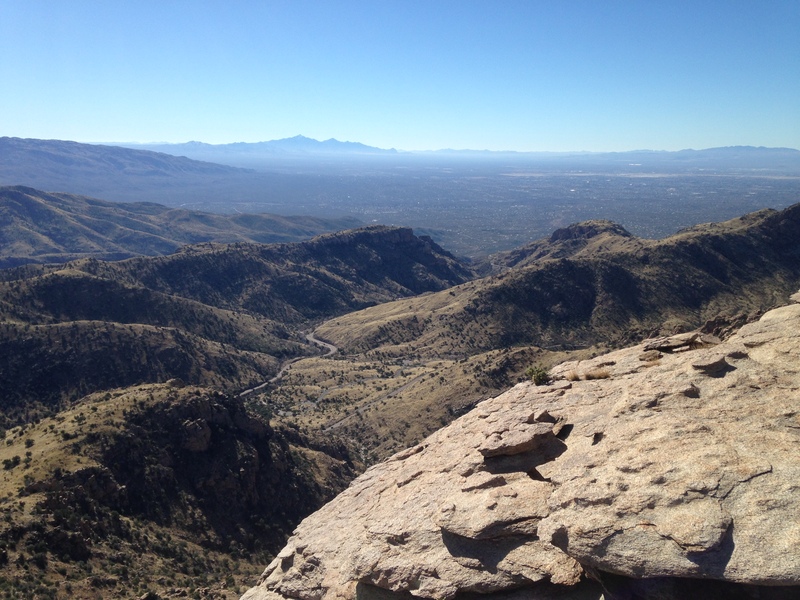 Shortly before reaching Molino Basin you join the Arizona Trail. The whole loop is just over 5 miles, but because of the terrain it takes much longer than the typical 5 mile hike. Expect to take several hours, and even more if you climb Molino Thimble. If you decide to just hike up to Airmen Peak, or want to do the loop counter-clockwise, you should follow the directions in one of the pages I link to below. A good description and lots of photos of the clockwise loop and hike up Airmen Peak from the people at Summit Hut. A great page about Airmen Peak. 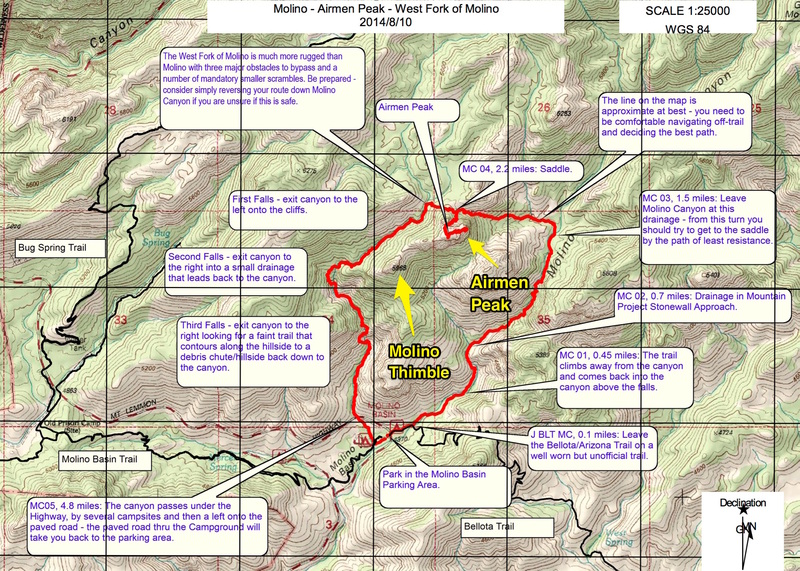 It’s from this page that I got the map shown above, and the quote about how the peak got its name. Here’s a link to the original PDF of the map.